Owning an Asian restaurant can be a fun-filled and exciting experience. However, providing customers with great-tasting food is not the only responsibility of a professional Asian restaurant owner. Keeping your entire establishment clean and sterilized throughout is the only way to satisfy the health codes in your area and protect the health of the diners who visit your establishment. The first step in keeping a restaurant clean is to effectively sterilize all surfaces and cutting utensils. In an Asian restaurant, raw ingredients such as eggs, chicken, and pork may come in contact with knives and surfaces. Failing to sterilize these surfaces can result in the cross-contamination of dishes and the spread of food-borne illnesses such as e coli or salmonella poisoning. Keeping food refrigerated is also an important cleanliness step. Food that is not refrigerated can turn into a breeding ground for dangerous bacteria. This is especially important on a sushi bar where raw fish must be kept at low temperatures to prevent the spread of bacteria. It is crucial to clean the dishes and silverware that your customers use with high temperature water and an effective sterilizing and cleaning agent. Washing dishes by hand in tepid water will not remove dangerous germs and bacteria. If your restaurant does not have an industrial-strength dishwasher, you may need to provide your customers with paper or plastic plates, bowls, cups, and eating utensils until one can be purchased. One of the most difficult types of Asian eating establishments to keep clean is also one of the most popular types of Asian restaurants: the Asian buffet. Because consumers like to sample a large variety of Asian dishes when they are dining out on Asian food, the buffet has become one of the most prevalent Asian eating experiences throughout the world. However, any buffet-style restaurant presents unique challenges for cleanliness and sanitation. It is important to post signs requesting that customers use new dishes and silverware each time they return to the buffet. This will prevent the spread of germs from customer to customer. Shielding food on a buffet with protective sneeze guards will also prevent the spread of germs. In fact, most current health codes require that buffet food be shielded by protective sneeze guards. It is also important to keep hot food hot and cold food cold when you have a buffet at your Asian restaurant. 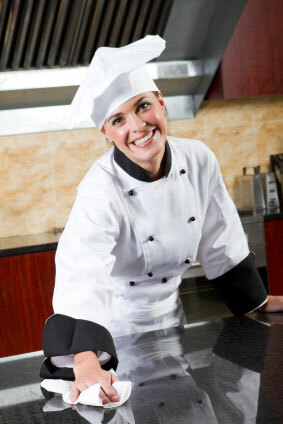 Using hot food stations with steam table pans to keep food hot will prevent the spread of bacteria. While cold food tables will keep fruit, pastries, cold vegetable dishes, and sushi from developing dangerous bacteria. Also, be certain to keep food covered when transporting it from your restaurant's kitchen to the buffet. Walking with uncovered food is unsanitary, and uncovered food can quickly become contaminated. Asian restaurants are incredibly popular among consumers throughout the world, but it is important to keep your restaurant clean and sanitized. Without proper sanitation practices, your restaurant could contribute to the illness of paying customers and destroy your reputation as a quality eating establishment.